A whooping 50% off for early registration! 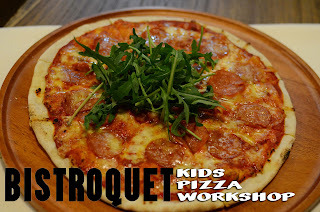 Have fun making pizza with your children in this fun and educational workshop. Learn how to make your own pizza, and the best part is that you get to bring it home for dinner after baking it in a wood fired oven! Brought to you by the good people of Bistroquet at ARC. Fire, smoke and charcoal gives our food its deep character and natural taste. At Bistroquet, we practice simple and traditional cooking style that celebrates great ingredients and their amazing flavours.The restaurant kitchen is designed open, with a specially-made wood-fired oven which brings out warmth and openness to our guests. Our pizzas are thin crust and our super hot oven makes them nice and crispy. We are not boring, our menu changes every 2 to 3 months, we love to bring you new, exciting dishes all the time while keeping the ones you love. Pizzas are all about togetherness and friendship to us. Come with friends and family, savour our pizzas and grills with our unique selection of craft bottle beers and wines.